A visitor to Uganda gives a fascinating personal account of a thrilling face-to-face encounter with a group of mountain gorillas. As soon as I step out of the plane, I feel the comfortable warmth around me and I smell the typical scents in the air. This is Africa! A representative of Great Lakes Safaris welcomes me and transfers me safely to my hotel. On our way he talks enthusiastically about his country; it is clear that he is very passionate about his job. The safari starts very early in the morning as we head towards the impenetrable part of southwestern Uganda. While trying to find our way out of Kampala, I am surprised by the commotion in the city. Matatus and boda-bodas, used for local transport, pass other vehicles where they can. People are walking down the road, greeting each other genially. Somehow everybody knows his or her way through the seeming chaos. Soon we leave the hustle and bustle of the city life behind us and drive peacefully through the country. Again I am surprised, this time by the greenness of the landscape. No country in Africa could be associated more with tropical forested hills and green valleys. Slowly the number of cars on the road decreases and I try to catch a glimpse of the daily life in the countryside. Small villages are relieved by banana plantations and rice fields. Herds of Ankole cows are grazing peacefully in the savannah grasslands, their heads adorned by long curving horns. We quietly pass the area known as the 'Switzerland of Africa' with terraced farming and mountain scenery. As we approach Bwindi the landscape gets more mountainous. Bwindi Impenetrable Forest is located on the edge of the Western Rift Valley, covering 130 square miles of an incredibly dense rain forest that is more than a million years old. Roughly half of the world's population of mountain gorillas make their home in these Afromontane forests. In the evening we reach Buhoma Homestead via a bumpy, curving road. The camp is located opposite of the park entrance. It is one of the original camps at Bwindi. I'm led towards one of the self-contained cottages, where I can enjoy the view over the forest canopy from my private veranda. After a delicious meal I settle myself in front of the fireplace that warms the cool evening and start to feel anxious about tomorrow. Finally I will face the giant animals that have brought me all the way to Uganda! It is cloudy when I start the hike through the African jungle. The mist that has been lingering in the valleys coats the park with a mysterious atmosphere. Together with seven other tourists at the headquarters of Uganda Wildlife Authority, I receive a briefing from the rangers about the up-coming hike. Our international group, consisting of Americans, Spaniards, Italians and Australians, are accompanied by rangers, trackers and some porters. We are informed that the hike can be tough, with lots of steep and muddy parts. However, I am determined that nothing will stop me from my meeting with the gentle giants. The trail we follow disappears after some time and soon we're just cutting our path through the thick tangle of the forest. It is magnificent and breathtaking! We pass streams and waterfalls. We climb and descend. The sounds and smells of the forest make me curious to what is behind the abundant jungle cover of vines, bamboo and huge trees. This is how Africa has been for centuries: mysterious and untouched! After three hours we still haven't found a trace of any gorillas. The forest density makes our hike more and more difficult and the steep hills are merciless. Unexpectedly, then, we reach the place where a group of gorillas spent the past night. We must be close now! Still our hike continues. More and more often I have to stop to catch my breath, and I start to realize that this journey is not as easy as I had anticipated. But giving up is certainly not an option that has crossed my mind! Then, all of a sudden the guide gives us a sign. "There they are," he whispers. We have come face to face with a group of mountain gorillas. I forget everything around me and only have eyes for those immense dark shapes, sitting peacefully together. Quietly we try to get nearer, as the impressive silverback male gorilla watches us closely. I observe the amazing animals and wonder at their human features. They are so strong and yet so vulnerable! A baby gorilla stares curiously at our group. Other gorillas are sitting in the dense undergrowth, not disturbed by our presence. Suddenly one of the adults slowly moves in my direction. I hold my breath because I know that we should keep a minimum distance of 30 feet from them. At 10 feet she finally stops, sits down and starts to eat slowly. Her eyes, black and gentle, make me feel very humble. The guide brings an end to the magical moment by making it clear that it's time to go. An hour has past; without a doubt the fastest hour of my life, I think, as I reluctantly back away. We start our way back to the camp, climbing through the fields and woods. Tired but extremely satisfied and happy we reach the camp. I still find it hard to believe that I really spent time with the gorillas; that they allowed me in their world for a while. Being there with these gentle apes, surrounded by nothing more than the African jungle, leaves me with an incredibly privileged and fortunate feeling. Their kindness, peaceful nature, and amazingly human features have impressed me deeply. It was a beautiful and humbling experience that I will cherish for the rest of my life. 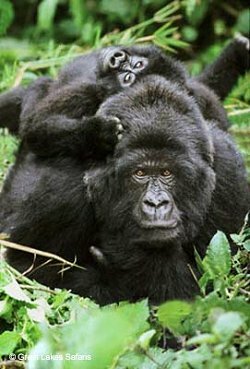 Eager to be one of the few privileged people in the world who get to meet the impressive mountain gorillas? Don't hesitate to contact us for more information and inquiries. Great Lakes Safaris is one of the leading tour companies in Uganda, with unmatched expertise and the availability of the best safari guides in the country. With a strong emphasis on personalized customer care, we will tailor your safari to your individual needs and budget, making sure it will be the experience of a lifetime. And although tracking the gorillas will certainly be one of the highlights of your trip to Uganda, the country has so much more to offer. You will be amazed by the diversity of wildlife and bird species, the snow-capped mountains and the crystal clear crater lakes, surrounded by exuberant tropical forests. Let's not forget the challenging, mighty streams of the Nile and the heartwarming smiles of the people! Uganda is truly the Pearl of Africa!